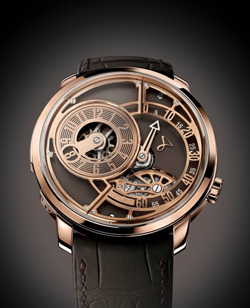 Scrolls and ink have given way to a research and development department with computers and 3D software, but projects, tests, finishing and assembly of these Haute Horlogerie timepieces are performed entirely in-house. Of Hautlence and mechanical solutions adopted by the mark I’ve written more than once in the past. Here you can find other posts that deepen the sophisticated mechanics of complex systems and jumping backward, traditional name of Maison, governed by special rods. The new HL c 06 is like the others who have gone before a mix design – simple but not obvious – and a lot of complicated mechanics. The latest addition to completing the collection Hl c – one of the five marketed brand – will be built in a limited edition of 88 copies, a number that really like to Asian markets. The case measures 41 mm and has a very minimalist design: the lugs and bezel are copied in style and proportions, the gold is almost pink in color with shades of chocolate brown opaline dial, where, this time arranged in a circle, is immediately evident the typical and original interpretation / representation of the time Hautlence alternating conventional retrograde circular trajectories of different amplitudes. With a sharp three-dimensional effect are face down the disk of jumping hours and retrograde minutes hand assembled on a chassis frame. The first, represented by a disk carved with Arabic numerals and concentric circles suddenly snaps to the next hour when the minute hand – like the skeleton scale brand – also snaps back to zero after the sixtieth minute. Everything is controllable by conventional crown at 4 o’clock. The mechanical movement with manual winding manufacture movement is the third developed by Hautlence, decorated with Cotes de Geneve bridges finished with a chamfering done strictly by hand. Individually numbered – 01/88 – 06 c HL coast version with alligator strap with pin buckle Swiss Francs 57,000, and 60,000 in the version with folding clasp, both rose gold 18 k – 4n.